3 days left. Contact your MP now! 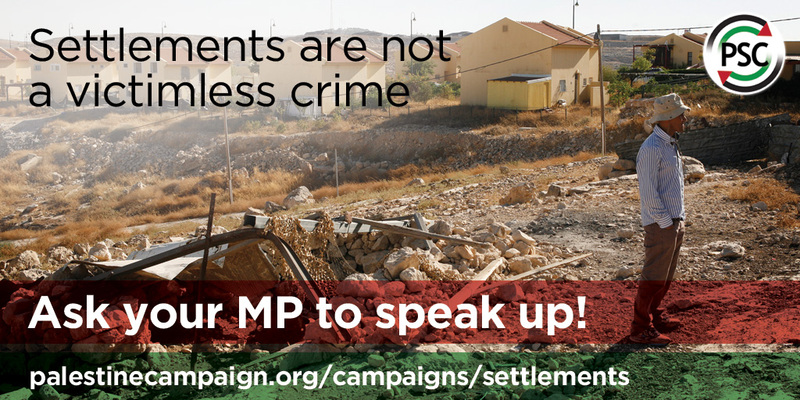 In 3 days days time, Thursday the 9th of February, your MP will have the chance to take part in a parliamentary debate on Israel's illegal settlements. We need to make sure they not only condemn settlements, but that they demand concrete action to be taken against them. We want the government to review all of their financial dealings with settlements, and make sure products from illegal settlements are banned from the UK. This is a fantastic opportunity to raise the issue of Palestinian rights in Parliament. So far, almost 8000 of you have written to your MPs asking them to join the debate. However, so far, not enough MPs have confirmed they will take part in the debate. We need to make sure MPs cannot ignore this. Please, if you haven't already, write to your MP today and urge them to speak out. Copyright © 2017 Palestine Solidarity Campaign, All rights reserved.